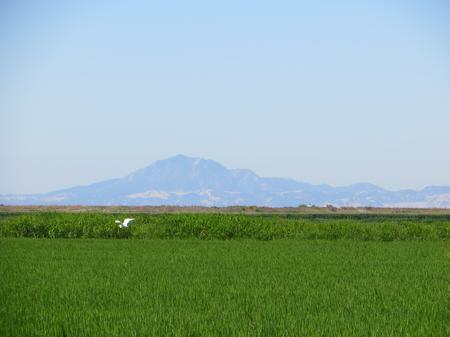 Delta rice production with Mount Diablo in the background. The Delta region of California is located at the confluence of the Sacramento and San Joaquin rivers. In addition to the Sacramento and San Joaquin, the Mokelumne, Cosumnes, and Calaveras rivers – and numerous tributaries – deliver approximately half of the state's annual runoff to the San Francisco Bay by way of the Delta (DWR, 2008). While the region is known for its waterway configuration, the Delta is also unique for its fertile soils. The soils range from peat to mineral. The peat soils are the remnants of decomposed tule marshes, and the mineral soils are the result of alluvial deposits from waterways. These soils were reclaimed in the mid- to late-1800's when levees were constructed to contain water within channels, allowing "islands" to be farmed. The area of the Delta is approximately 738,000 acres (DWR, 2008). The majority of this area – over 500,000 acres – is agricultural land spread over five counties: San Joaquin, Sacramento, Yolo, Solano, and Contra Costa. Food, fiber, and forage are grown in the Delta. See the Delta Crops Calendar for the timing of operations for these Delta crops: alfalfa, asparagus, corn, processing tomatoes, safflower, and winter cereals. 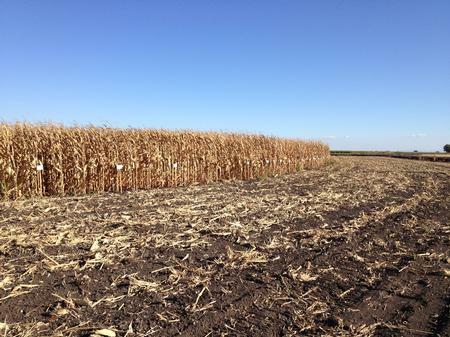 UCCE field corn variety trial, conducted annually on Tyler Island.